Place the base object in the center of where you want the wall to be. The walls are 10m long, so position the base object's axis point 5m away from adjacent walls. To start the next story up, just move the base object up (usually 5m), resting it ontop of the lower wall. Some clumps are designed to be used with trimming, to fill in the holes. 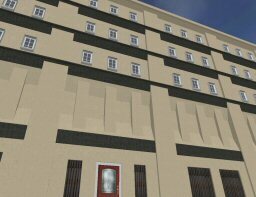 All walls use a stock texture - rock2 - so texture customization still needs to be done manually.